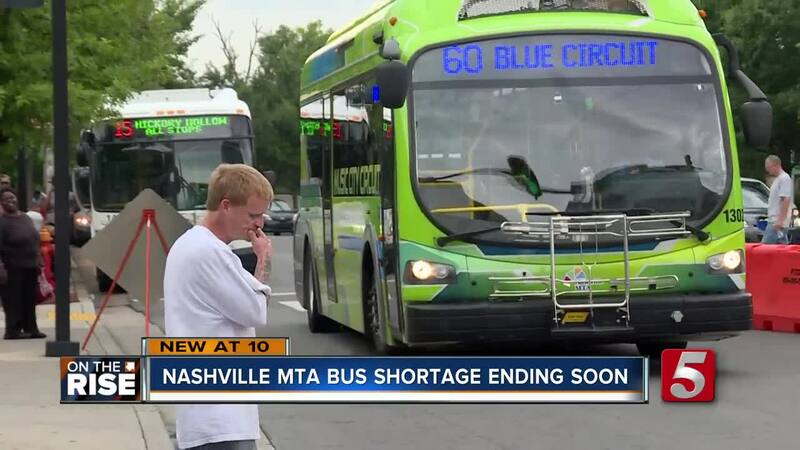 Nashville's Metropolitan Transit Authority will begin rolling out new buses and vans on July 12. This comes as eight bus routes are operating on temporary service adjustments between 2:30 p.m. and 6 p.m. Monday through Friday due to a bus shortage. Tamika Douglas has used the Nashville's bus system for five years. She said lately, the shortage has been a concern for herself and other commuters. "It's been very inconvenient to have routes cut off. Not only our routes cut off but service times are reduced. I know MTA has to do renovations. They have to make it better, right now it's very, very uncomfortable," Douglas said. MTA officials said they plan to have 31 new buses and 19 new vans arriving over the next two months to put on the streets that will help alleviate the number of buses pulled from the road due to mechanical needs. "For the safety of our customers and to create a more reliable service, we enacted short-term service adjustments on a handful of routes to bridge the gap between this shortage and the arrival of our new buses," MTA spokeswoman Amanda Clelland said. Clelland also said the temporary reduced routes will cut down on the amount of unexpected trip cancellations customers experience. Douglas said she hopes the arrival of new buses will reduce travel time and also help people living in transit deserts. "We need to be extending buses to places that don't have services and provide more times for pick up," she said. About 17,000 people visit Music City Central daily. As renovations take place, bus drivers and riders said they hope service gets back to normal soon.